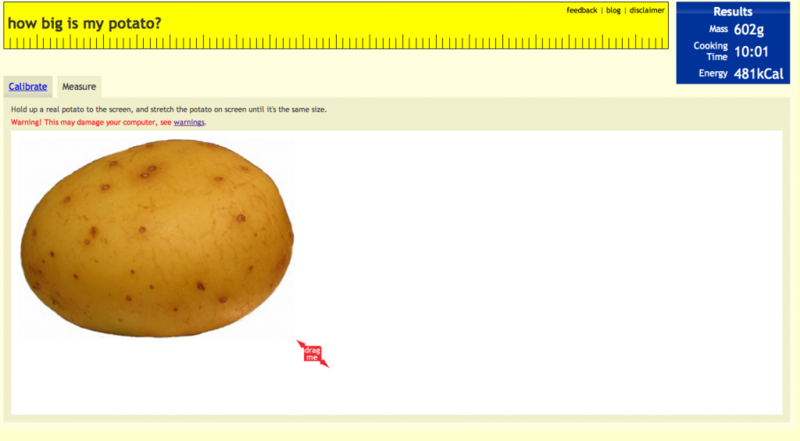 Dr Ali Roberts emailed me a great link: How big is your potato? After calibrating the scale on your screen with a credit card you can drag the size of the virtual potato to resemble the size of your real potato. A little box then displays its cooking time and more importantly – and in some cases shockingly – its calorie content. The website is accompanied by a blog which explains the background story and steps involved in building it. Thanks for the link, Ali! ← PSI – Who killed Arabidopsis thaliana?